Super Box Truck Ramps-Want to Save Time? In the past, pickup trucks with trailers were the standard for landscape companies. Today the standard of [wildly successful!] landscape companies are medium duty trucks such as the Isuzu or Mitsubishi/FUSO LCF trucks. Used cargo vans from Penske, U-Haul, Budget, Enterprise, and Aaron’s are easily being converted to lawn trucks. These versatile trucks offer nearly endless options for moving/dump/box truck configurations. Until now companies seeking a manual style loading ramp for their trucks have had to gamble with makeshift ramps and homemade applications. These are neither safe nor cost efficient! After all, are you in the business to make money or design loading systems for trucks?? Look no further! Our MR 750 ramp will save you the time and guesswork of building (or ordering) a safe ramp that will meet your needs. 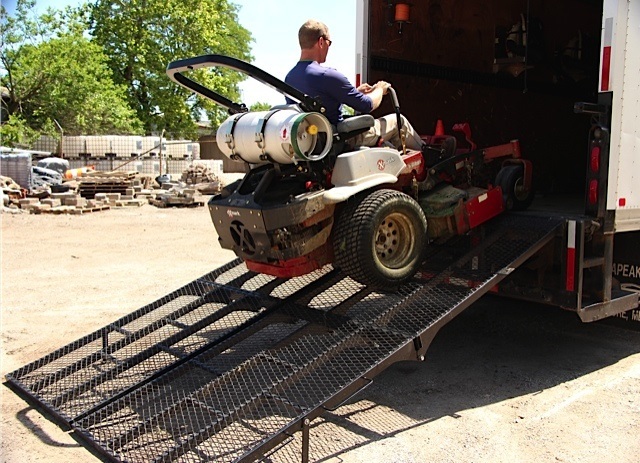 The MR 750 is a bi-fold, fully welded all steel construction ramp that is 10’ in length with various widths to accommodate almost any size enclosed body (per ramp) and locks in the fold position at just 10” deep. A single worker can open or close the ramp with our dual gas shock assist design.